Yesterday, Nursultan Nazarbayev, President of Kazakhstan, launched the production of an innovative food product based on "НӘР" synbiotic drink during the nationwide TV bridge "The New Industrialization of the Country: Leap of the Kazakhstani Leopard." "Research made by Nazarbayev University scientists have become in demand for real business. One of our projects went from development to industrial production. We want to present a new innovative product to the country on the basis of the "НӘР" synbiotic," said Kanat Baigarin, Vice President of Nazarbayev University. Ivan Sauer, Director of "Agrofirma Rodina" LLP said that this is the first functional food product to be produced in our country. "НӘР possesses a number of unique properties, raises immunity, promotes active longevity. I ask you to start the production of the drink on the basis of the agrofirm "Rodina," - said Ivan Sauer, addressing the President. It is need to mention that "Rodina" farming company started to produce the "NӘR" synbiotic beverage on the basis of its existing dairy plant. 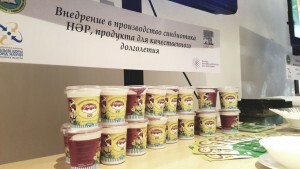 This year a trial launch of the beverage and its sale is expected around the territory of Astana and Akmola region. “NӘR” was created by the scientists from the Life Science Center, NLA. The production of this synbiotic, which is a product for the high-quality longevity, is a long-awaited event for the National Laboratory Astana. The probiotic leaven is recommended as an auxiliary therapy for diabetes mellitus, arterial hypertension and obesity. The drink will also be recommended as the part of a five-day diet into Kazakhstan's pre-school and school educational institutions, medical and social institutions, health resorts and sanatoriums of the country. This synbiotic yogurt drink consists of probiotic leaven, pectin, prebiotic ingredient inulin, fish collagen, which is a source of essential amino acids, vitamins, trace elements, and completely natural milk. The effectiveness of "NӘR" has been confirmed in pre-clinical and two phases of clinical trials, the drink has also the biosafety report. This project was financed with the support of the Science Foundation of Kazakhstan. Nursultan Nazarbayev, President of Kazakhstan, signed a decree on awarding the State Prize in the field of science and technology named after al-Farabi, the Akorda website reports. The President awarded the state prize in 2017 in four categories. Gulnur Tanbaeva - Deputy Chief Doctor of "Central Clinical Hospital" JSC, Doctor of Medical Sciences, Professor. Yerlan Sagadiev, Minister of Education and Science of the Republic of Kazakhstan, awarded Maxat Zhabagin, junior researcher, NLA by the special prize named after D.A. Kunayev for the best work in the field of natural sciences. 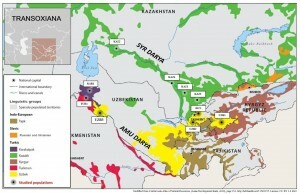 The prize was awarded for the scientific work “the Connection of the Genetic, Cultural and Geographic Landscapes of Central Asia". This work Maxat Zhabagin, Laboratory for Population Genetics, NLA in cooperation with Oleg Balanovsky, Elena Balanovska, Zhaxylyk Sabitov, Marina Kuznetsova, and others published in Scientific Reports 7, article number: 3085(2017). Authors have analyzed Y-chromosomal variation in populations from Transoxiana, a historical region covering the southwestern part of Central Asia. They studied 780 samples from 10 regional populations of Kazakhs, Uzbeks, Turkmens, Dungans, and Karakalpaks using 35 SNP and 17 STR markers. Analysis of haplogroup frequencies using multidimensional scaling and principal component plots, supported by an analysis of molecular variance, showed that the geographic landscape of Transoxiana, despite its distinctiveness and diversity (deserts, fertile river basins, foothills and plains) had no strong influence on the genetic landscape. The main factor structuring the gene pool was the mode of subsistence: settled agriculture or nomadic pastoralism. Investigation of STR-based clusters of haplotypes and their ages revealed that cultural and demic expansions of Transoxiana were not closely connected with each other. The Arab cultural expansion introduced Islam to the region but did not leave a significant mark on the pool of paternal lineages. The Mongol expansion, in contrast, had enormous demic success, but did not impact cultural elements like language and religion. The genealogy of Muslim missionaries within the settled agricultural communities of Transoxiana was based on spiritual succession passed from teacher to disciple. However, among Transoxianan nomads, spiritual and biological succession became merged, leading to the formation of haplotype mini-clusters among nomadic clergy.